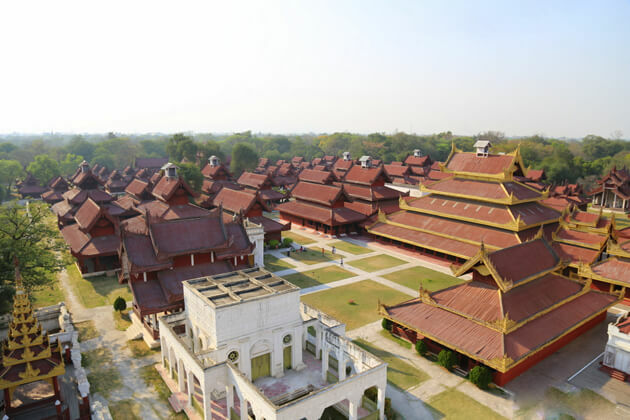 Mandalay tours & day trips bring you to the center of culture, tradition, and impressive pagodas. Located 600 km north of Yangon and on the bank of Irrawaddy River, Mandalay is the second largest city in Myanmar. This place was the royal capital of the last monarchy of Myanmar. Mandalay was badly damaged during fierce fighting in World War II including the royal palace, which has been recently reconstructed. Take Mandalay trips to set foot on the land that is well known for its cultural, traditional, and spiritual splendor but also for its exquisite handicraft such as embroidery, gold leaf, wood, stone carving, bronze casting etc… Nearby Mandalay stands several old capitals such as Amapura, Sagaing, Ava, Mingun where the Kongboung dynasty kings established their capitals. Go Myanmar Tours offers interesting Mandalay tour packages. Have a look at our recommended itineraries for Mandalay tours as below or contact us to tailor-make a unique Mandalay tour that suits your price and interests. Mandalay, though it does not possess the second largest freshwater lake like Inle Lake and over 2000 pagodas like Bagan. Nevertheless, once you take a Mandalay tour package and marvel at this stunning landscape, it will never fail to captivate you with the holy religious sites, white-washed temples as well as the magnificent view from the Mandalay Hills. Mandalay – the second largest city in Myanmar definitely offers you with myriads of things to experience, see, and taste. Step aside from the ancient religious sites, Mandalay tours will transfer you to the dignified palace that ensures to captivate your soul. In order to deliver you the best of this cultural city, we highlight the top 7 awesome activities to do in Mandalay tours as below. 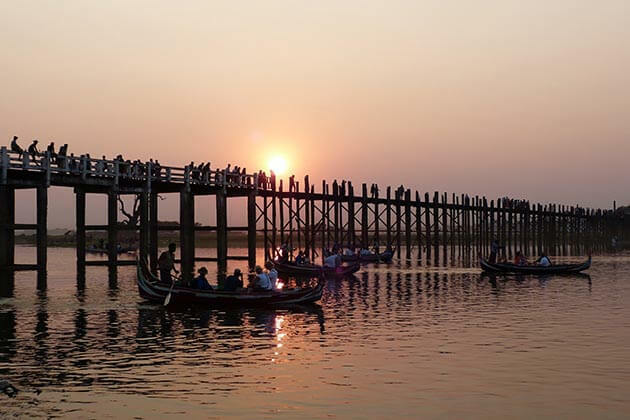 Not only is a symbol of Myanmar’s culture, tourism, but U Bein Bridge was also voted as one of the most beautiful sunset spots in the world that should not be missed in any Mandalay tour packages. Hence, visiting the famous bridge is one of the best things to do in Mandalay trips. The bridge was built in 1851 and took three years to complete, the total length of the bridge is 1.2 km with more than 1000 supporting pillars. 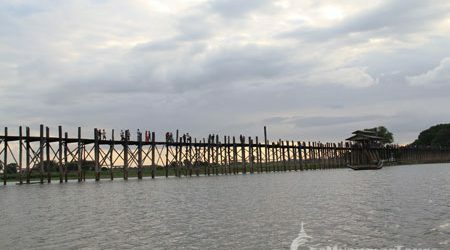 A Mandalay day trip will bring you to the U Bein Bridge that is well-known as the longest wooden bridge in the world so far, it is still solid and becomes the lifeblood of local people here. Besides, some people believe that if two people love each other, holding hands together across the bridge, they will forever be together. Whenever taking a Mandalay tour package, Mahamuni Temple is a destination that cannot be missed in any itineraries. It is the most sacred temple in Mandalay and its popularity is only behind the Shwedagon Pagodas in Yangon. A visit to the temple in Mandalay day trip will introduce you about the story of the construction. That, according to legend, King Candrasuriya asked Buddha to make a statue of his size for worship at Mahamuni Temple. In 1784, King Bodawpaya captured Arakan and transferred the statue of Buddha with his troopers and captives. He built up the temple at the foot of Mandalay Hill to preserve the most sacred Buddha statue in the region, to confirm his devotion. 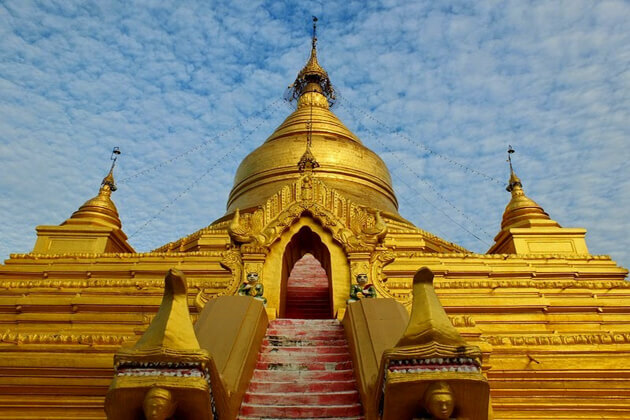 Tourists on Mandalay day tours can see in the main hall, there is still a statue of Buddha of 3.8 m high, made of gold and decorated with precious stones, only men can approach and gild the statue. The giant white temple is in the northern end of Mingun Village is where worth a visit in your Mandalay tour. Built in 1861, the name of the temple was named after a queen, Hsinbyume, who had passed away while giving birth. 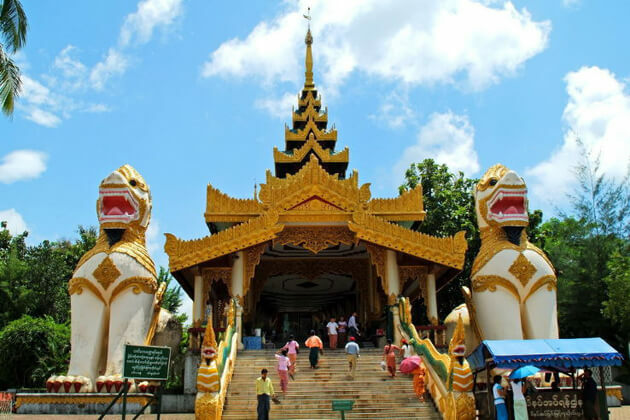 Among Mandalay tourist attractions, Kuthodaw Temple is the must-see spot for anyone who is taking a Mandalay day trip. The temple contains the largest marble Buddhist scripture in the world. Built in 1857, Kuthodaw Temple consists of the main temple and many small towers. Specifically, the main temple is inlaid gold totally, shining under sunshine. Tourists on Mandalay tour packages will have a chance to challenge themselves on reading the special symbols that carved on the slabs. Snake Temple is another name of Yadana Labamuni Hsu Taung Pye Paya Temple. Gaze out at the temple somehow is an amazing but challenging activity to do in Mandalay tours. Starting in the 1970s, three large snakes came here and slept around the Buddha statue. Since its appearance, the giant pythons in the temple have never left. Otherwise, they have become the goddesses that are respected by the faithful and the monks every day. If you have never been in Mandalay, we highly recommend you experience the gold leaf production in your Mandalay day trip. The former capital of Myanmar has quite a lot of gold leaf production workshops for visitors to experience in Mandalay tour packages, and King Galon is one of the oldest and most famous gold workshops in Mandalay. 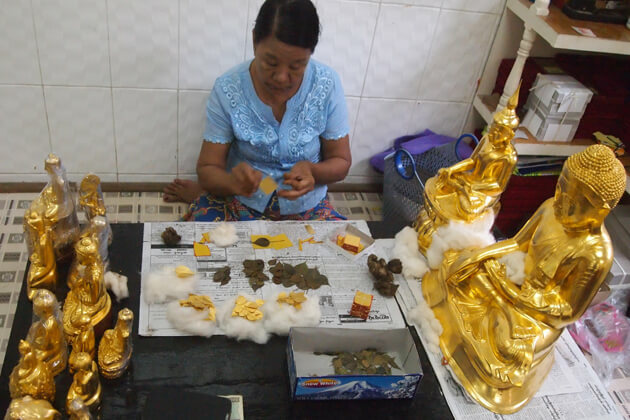 Whenever you find yourself in a Mandalay day tour, manage to watch the process of making gold leaf, everyone in King Galon is very happy and enthusiastic, so you would probably have the opportunity to try to hammer into the gold package below. This experience is free but of course, this is not easy work. With its long-standing popularity, Mandalay Palace deserves a place to visit that you should not miss on your Mandalay tour. The Palace was the primary royal residence of King Mindon and King Thibaw, the last two kings of the country. 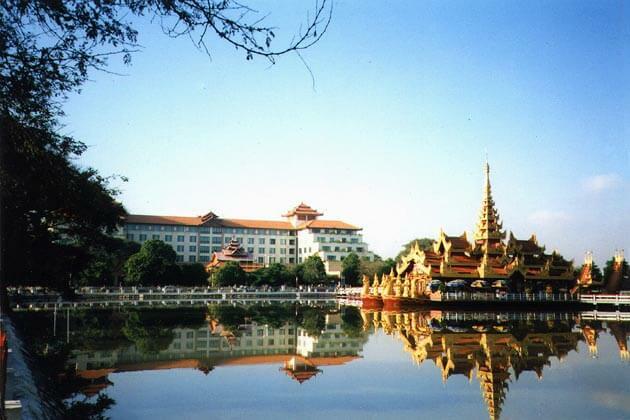 Your Mandalay day trip takes you to the marvelous palace that all parts are magnificently constructed, teak and gilded. Moreover, the last palace citadel's four 2 km long walls form a perfect square, 8 m high, 3 m thick, complete with a total of 48 bastions. Although the entire palace was burned down by bombs during World War II, the external walls and moats still exist today. The palace was completely rebuilt in 1989 and became one of the most outstanding tourist attractions to visit in Mandalay tour. Finally, even if you cannot come here, don’t forget to enjoy the beautiful Mandalay Palace sunset in Mandalay sightseeing tour. The reflection of Mandalay on the east moat is a beautiful sight that you would be catchy. Savor Mandalay street food is a fantastic activity that we highly recommend you to experience in Mandalay day trip. Similar to other Burmese cities, Mandalay also has Burmese traditions such as traditional rice with regular food, Shan noodles, Mohinga noodles, Shwe Taung Tan pork noodles, roast duck, hot milk tea,…etc. 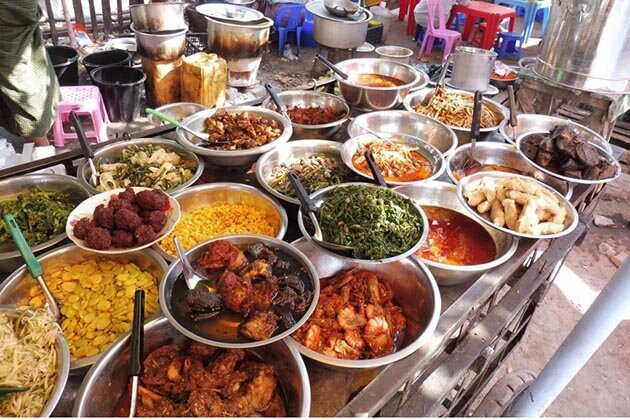 Take a food trip in the Mandalay tour package and taste the best of the city through the stalls and vendors. 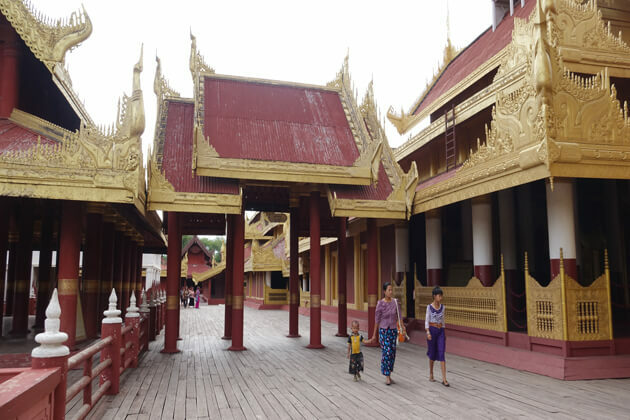 You enter the city center right next to the Mandalay Royal Palace, walking around the morning market with lots of bright boutiques including baked goods, hot desserts and delicious hot milk tea, which characterizes the life of Burmese people. More specifically, you can also take a Mandalay tour around the city by bike so that you can stop anywhere to enjoy the food. Surely, the Mandalay dishes will be something you cannot forget in a Mandalay day tour. 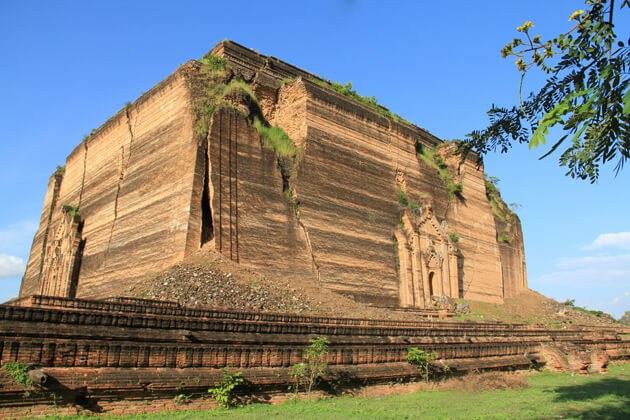 If you are someone who would like to learn profoundly about history in Myanmar, do not miss the ancient village of Mingun - the most important historical sites of Myanmar in your Mandalay tour package. Mingun is about 11km from Mandalay, and thus you have two choices to go there: walking or boating. The first destination worth mentioning to visit in Mandalay tours is the unfinished-ruin Mingun Pahtodawgyi Pagoda - a red brick temple that if it was completed, would be the largest brick Buddhist temple in the world with a planned height of 150m. Despite never completed, the ruin Pagoda is still as small as a hill, enough to admire. The huge cracks in the 1838 earthquake not only destroyed but also enhanced the impression of this heritage. From there you can stroll through the Mingun Bell for short sightseeing in Mandalay tour package. Mingun Temple is not far away is the world's largest bell weighs 90 tons, it was carved separately for the temple but never used. The most famous ancient capital Inwa (formerly known as Awa) is highly recommended for you to visit in your Mandalay tour package. 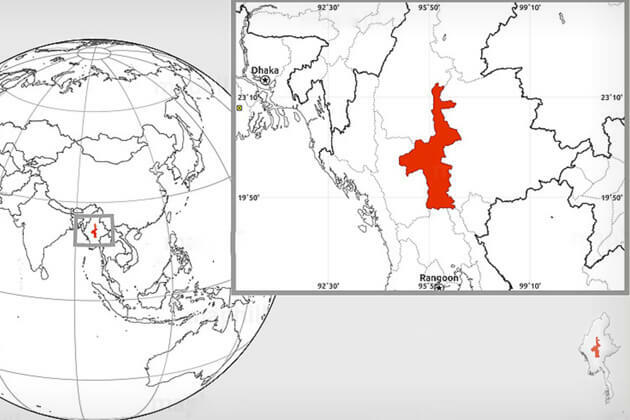 In the past, Inwas used to be Myanmar’s capital from 1365 to 1842. Lies about 20 kilometers away from Mandalay, the city making itself standout by the construction on an artificial island. It is due to the earthquake in 1839 that the city was damaged and then abandoned. So far, it has maintained its long-lasting history in the ruins, stupas, and monasteries. While most visitors like to take a horse cart to explore the city, you are still able to take a bike tour in Mandalay tour package to slowly enjoy the beauty of the charming landscape. Stay in the heart of Myanmar, Mandalay weather features the tropical monsoon climate characterized by a high rate of rainfall and humidity. The best time to enjoy Mandalay tours is winter time from November to February when it is driest and coolest. You can also enjoy Mandalay tours from March to October but keep in mind that you should prepare a hat, suncream, long-sleeved shirts to avoid the heat. Mandalay is situated in the middle of Myanmar and has a tropical dry, hot and wet climate according to the Koppen climate classification. In 2016, the average temperature in Mandalay was 26°C (79°F), specifically, the average daytime temperature was 34°C (93°F) and the average nighttime temperature was 23°C (73°F). With the information provided in the following, you can choose your most convenient time to take the Mandalay tours. The climate is divided into three seasons which are the dry season, hot season and rainy season. Each season has it owns features and reasons to encourage the tourists spending their time in Mandalay. The dry season lasts from November to February, it is a quite pleasing weather with little rainfall and cool air. 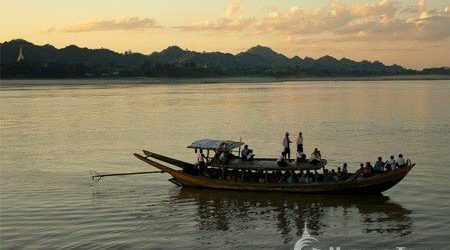 As a result, the dry season has become one of the most favorite time to take Mandalay tours to explore this land of tourists. Remember to drink lots of water to stay hydrated to make sure that your body and mind are healthy enough for the whole trip. Moreover, please note to be aware that you should book a hotel in advance as they are usually busy and full in this season. The hot season endures from March to April as the weather is featured with scorching high temperature and there is less rainfall. During the daytime, ultraviolet radiation is extremely strong, so if you are planning to take Mandalay tours in this period, do not forget to bring along with yourself the necessaries such as sunglasses, high SPF sunscreen, sun hat, long-sleeved shirts. When the temperature is incredibly high, especially from midday to 4 pm, you had better arrange and take part in indoor activities at your hotel. The rainy season begins in May and end in October with the southwest monsoon breaks out in May which brings rain showers to the region. Heavy rainfall may cause a few difficulties for the tourists such as flight delays, muddy roads, and unclear views. Therefore, you should be indoor and arrange some interesting activities to enjoy. However, it is the low season, the costs will be more low-priced than in the peak season, so in some aspects, this season would be the best time to visit Mandalay. During the months of rainy season, it is easy to get dengue fever (An acute mosquito-borne viral illness of sudden onset with a headache, fever, prostration, severe joint and muscle pain, swollen glands (lymphadenopathy), and rash). To avoid being by mosquitos, you should avoid exposing your skin in the grass and wear a thin long-sleeved shirt when going outside or taking part in outdoor activities. Mandalay people are friendly, hospitable with gentle smiles are always on their faces. They have modest and simple lifestyles and almost all of them are Buddhist followers. Mandalay is a multi-cultural city with its ethnical diversity and the Bamar (Burmans) occupy the majority among the ethnic groups. In recent years, there has been an inrush of Chinese from Mainland China and the local Chinese (both recent emigrants and descendant of colonial-era immigrants) that contribute 30 -40% to the population. The Chinese have given their influence over the architecture including China-style glass buildings throughout the city whilst the Yunnan dialect of Mandarin is spoken among the ethnic Chinese communities. 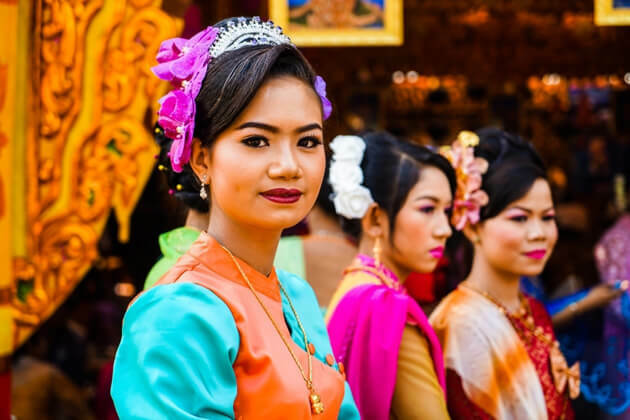 Other popular ethnic groups consist of the Shan, who are related to the Thais and Laotians in terms of language and ethnicity, and the Karen (Kayin). There is also the widespread appearance of Indian such as Nepalis and Sikhs. The name “Mandalay” might be the most reminiscent one among a bunch of destinations in Myanmar (mainly due to the famous poem’s name of Rudyard Kipling that was written in 1892, that was a love story of a British soldier and a Burmese girl when Myanmar was still the colony of Britain), and this city owns the resistible charms which need to be discovered. There is so much for you to enjoy and explore including temples, monasteries, and markets, as well as amazing street food and sweeping views from Mandalay Hill. 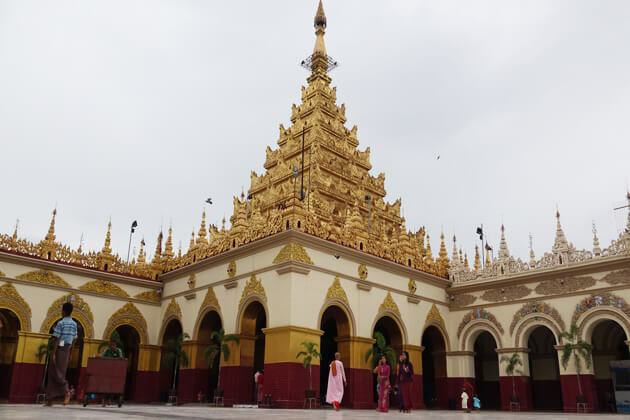 When being in comparison with many ancient capitals dispersed around the country, Mandalay is actually a comparatively new city which was built in 1857 as King Mindon was trying to regain the status for Burmese after the failure in the Second Anglo-Burmese War. Situated about 600 kilometers north of Yangon on the Ayeyarwaddy River, Mandalay today is the second largest city in Burma (after Yangon), and a former capital of Myanmar which is well-known for its cultural diversity. It is also the major trading and communications center in northern and central Myanmar and is linked by rail with other large Myanmar cities. Mandalay is surrounded by its ancient neighboring cities as Mingun, Sagaing, Innwa (Ava), and Amarapura and it has wide byroads filled with bicycles and motorcycles. 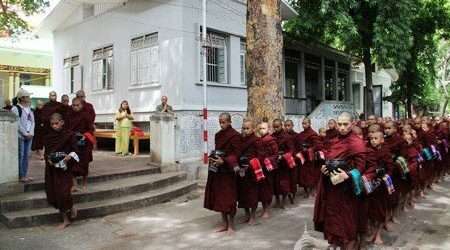 Particularly, half of Burma's monks have taken up residence in Mandalay and the neighboring areas. It takes about 45 minutes to drive from Mandalay to the village where you can take a small boat on dou-hta-waddy River to visit nearby pagodas. 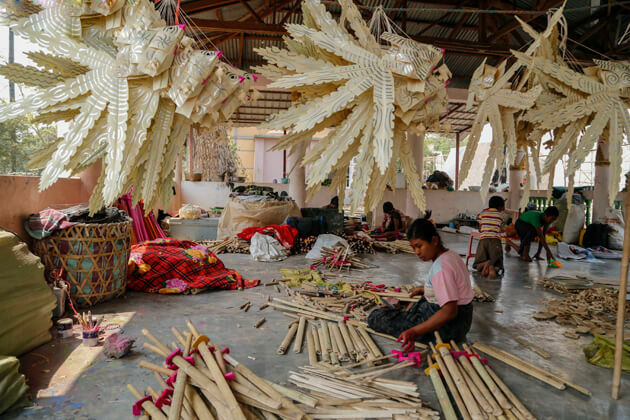 In the festival, they sell a wide range of village products including Myanmar traditional toys, boxes, baskets and mats made of dried toddy palm leaves. The dome-shaped constructions – stupas as Buddhist shrines are built from the sand with five layers within only one night and each layer of sand are propped up by bamboo sticks and mats. The date of this celebration varies within the day, so the visitors need to be lucky enough to experience this festival. The festival is held in late August and lasts for 5 days that is based on a legend of two Indian brothers who gained superpower and were then killed by the king. This is an occasion which gathers a large number of spiritual mediums from all the corners of the country. Every year, around the late of August, thousands of mediums (Nat-Kadaw) and worshippers head to Taung Byone by rowboat to make their offerings. 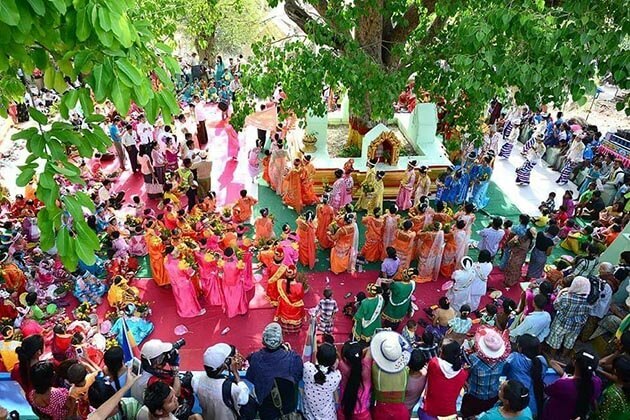 The highlight of the festival is the spirit dances; additionally, there are several other activities including the royal bath, upward movement to the throne, and cutting down the htein tree. There will be a lot of dealers appeared during this jolly period as well. In Burmese, Nat means spirits and it is said that Boe Boe Gyi has high level alchemical and later became a Nat. On the eve of the ceremony, pilgrims will throw tealeaf packets at one another and those who are hit must pay a visit next year. 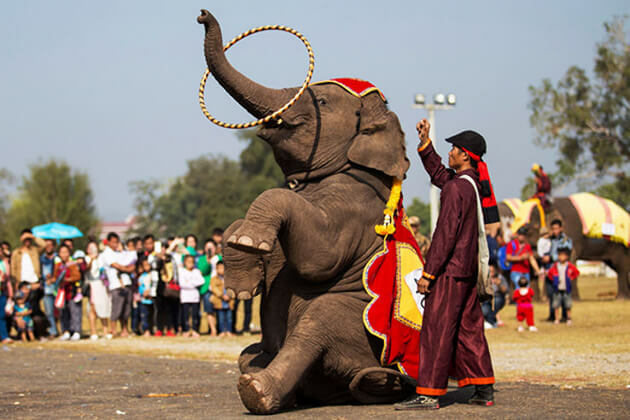 This festival of elephant dances (towards the end of Festival of Lights) is organized in Kyauk Se village which is about 25 miles away from the south of Mandalay. The bright-colored parades with the huge life-size elephant figures made of bamboo and paper walking around the city. There are men stay inside the figures and dance in the rhymes of Dobat and Drums throughout the country that makes the amazing and effervescent atmosphere, after that, they finish at the bottom of Mandalay Hill. The citizens take pleasure in listening to the radio programs broadcasted by M.B.S, watching the TV channels of MRTV and the Myawaddy. Light of Myanmar and Kye Mon newspapers are issued and distributed by the presses of Mandalay for Upper Myanmar. There are so many things to do the shopping in Mandalay, the main marketplace is Mandalay Zaycho. Almost all everything you need, you can find here and those things you should buy are Acheik (Mandalay Silk Longyi), Cotton clothing, Hto Moat (greasy cakes), Laphet (Pickled tea leaves), Kadipar slippers (Velvet Slippers), Silverware, Lacquerware, Jewelry, gems and more. Mandalay is the trade center of Myanmar, it also has the entertainment measures as well, including cinema halls, beauty salons, spas and karaoke lounge in almost all populated part of the city. There are also many well-known astrologers and palmist in this city, who can read your past and future.